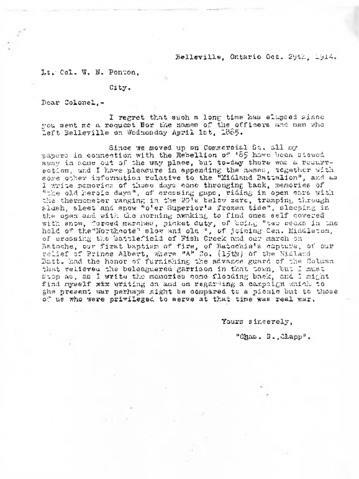 File contains a photocopied typescript letter from Chas. S. Clapp to Lt. Col. William Nisbet Ponton dated October 29, 1914 concerning the A. and H Companies of the Midland Battalion at Batoche during the Northwest Rebellion of 1885. Also present is a photocopied typescript list of veterans from the two companies who served during the Rebellion.